Truancy in Chicago is a major topic of public discussion, thanks to the latest revelations (published in the Chicago Tribune) showing that absenteeism and truancy in Chicago continue to be a major problem, as Chicago continues to refuse to hire truant officers. But the "truants" in Chicago in February 2013 are the top officers of the CPS bureaucracy, led by the "Chief Executive Officer" and the seven members of the Chicago Board of Education. All either of them are cutting the massive hearings being held across the city and making sure they don't hear the protests echoing from Howard St. to 135th St, against their plans to continue to destroy the city's public education system and replace public schools with anti-union charter schools. As usual, as the publication of the 2013 CPS Hit List (schools to be closed) gets closer, the official lies get more obnoxious. Take the claim, repeated every night at the school closing hearings in the "Networks", that "CPS is listening..." How can they listen when they are only hearing their own Power Point lies and are not keeping transcripts of those who are able to testify at the hearings (while most of those who want to speak are blacked out). While the majority of the top officials overseeing Chicago Public Schools are now from out of town (and officially listed by Substance as "Rahm's Mercenaries") some are more expensive than others. 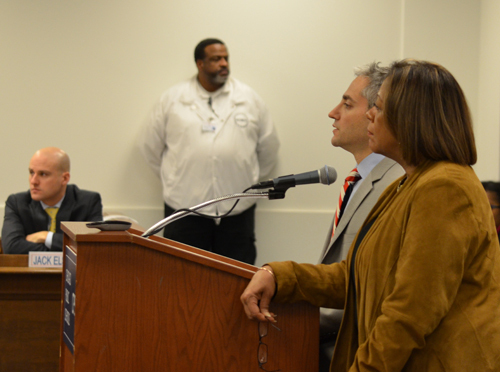 Above, Barbara Byrd Bennett (far right) and Todd Babbitz (beside Byrd Bennett) explained things to the January 23, 2013 meeting of the Chicago Board of Education while Jack Elsey left) looked on. One year ago, none of these three was a CPS official. Babbitz was hired as "Chief Transformation Officer" in July 2012 at an annual salary of $195,000 per year. Byrd Bennett was brought in as "Chief Education Officer" in April or May 2012. She was then promoted to "Chief Executive Officer" in October 2012 (at an annual salary of $250,000 per year, plus a $35,000 "relocation allowance" because she was imported from Detroit). Jack Elsey, the newest of the group, was put into the newly created job of "Chief Innovation and Incubation Officer" by a vote of the Board in December 2012. Elsey's annual salary is currently $165,000, and he received a "relocation fee" of $7,500. Substance photo by George N. Schmidt.According to one informed source, CPS Chief Executive Officer Barbara Byrd Bennett is beginning to feel the heat from the fact that she and the seven members of the Chicago Board of Education (all appointed by Rahm Emanuel) have been truant from the school closing hearings. Accodring to one informed source, at the Title 1 meeting at the Sheraton last week, Barbara Byrd Bennett, as keynote told, the audience that "Willie" from "LSC Relations" told her not to go to the school closing meetings. But other sources tell Substance that nobody in LSC relations has told her — or the Board members — any such thing. Once again, the Board members and the latest iteration of the CPS CEO can't get their stories straight. Lies are always hard to keep afloat, even when the Sun-Times and Tribune are trying to help with the "underutilization crisis" nonsense as much as they can. Now that more than 10,000 parents and teachers have turned out in less than ten days at the hearings -- virtually unanimously opposed to the closings and unwilling to get sucked into the Walmart-funded "focus groups" -- more and more people are asking how the Board of Education's seven members and Barbara Byrd Bennet are going to learn what is actually being said at the hearings. A quick look at the CPS website shows that CPS officials are refusing to keep a record from the hearings (a first, by the way) and instead have only published officially the "Network" Power Points, which simply replicate the latest CPS official lies. By blacking out the actual transcripts of the hearings, CPS and Byrd Bennett are going to try and make the claim, despite thousands of people who were there and no better, that somewhere out there in Chicago, there is "support" for Byrd Bennet's closing plans and for the 2013 Hit List. Maybe now citizens know why CPS doesn't have truant officers. If they were around, the first eight people they'd have to line up would be Barbara Byrd Bennett, Benry Bienen, Mahalia Hines, Jesse Ruiz, David Vitale, Carlos Aztoitia, Penny Pritzker, and Andrea Zopp. Not one of them has been at any of the hearings, and they are the ones who are supposedly "listening" in order to make the final judgment and vote. In case anyone believes the Board when it proclaims "transparency," consider the fact that at its January 2013 meeting the Board voted, unanimously and without debate, to destroy the audio tape record of its closed sessions going back several years. The storage of the audio tapes would have cost the Board nothing, but the preservation of the record would have enabled the public to compare what the Board published in writing as its version of reality to what was actually being said during those secret meetings.